Today we have a special mix from ‘Drug Machine (Mater Suspiria Vision Side-Project). We present The Electronic Body Implant Mixtape, one of the most bizarre sets we have ever had on T.O.P. keeping up the elegance of the old school italo-disco,techno,acid, punk and electro days. AMNESIA, the debut album of Drug Machine on Phantasma Disques could be ironically a vehicle to those days bringing back memories and making them reality again. The party has finished but please my witch bring it back to me, dress me up in black and pour some wine in my mouth and I will dance for you until the end. Amensia to now. Amnesia to what hurts. Amnesia to reality. Amnesia to conformism. Amensia to fear. This podcast is a taste of what is Drug Machine revealing to us. A combination of witch techno beats for a kind of rave for dead living souls. Exorcising spirits with sensual vocals like screams accompanied by acid patterns, maintaining the mind under a state of dark attitude that seems the only way.. From dark wave to progressive witch trance full of B movie images, dirty synths like life-death natural circle. Dancing to the rhythm of personal revelations. Catharsis of the human brain. Each track like an invitation to unconscious powers. You cannot resist to this DRUG MACHINE___ just forget what you already know and sacrifice your mind to your elevating soul. Drug Machine is the cold and industrial alter ego of Mater Suspiria Vision in an imaginary japanese dystopian technopolis à la Tetsuo. A Journey into the electronic body. Pulsating technoid beats and clear structures meet harsh cyberpunk noise. 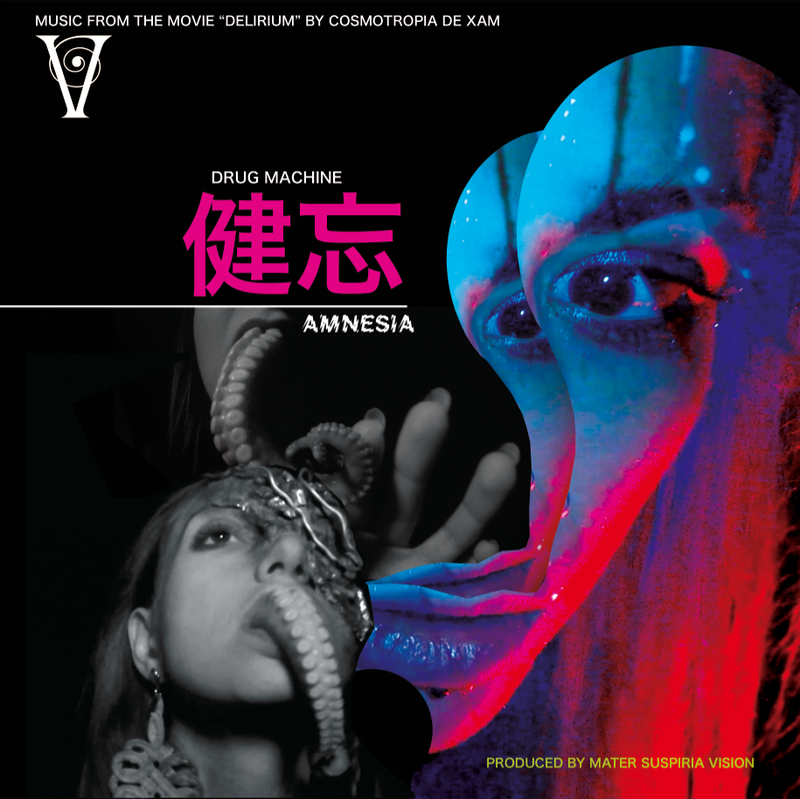 After their debut EP in 2012 “Killer Drugs (Phantasma Disques)” AMNESIA is the long awaited Debut album by Drug Machine accompanying Cosmotropia de Xam’s latest movie “Delirium” starring Shivabel Coeurnoir (Malacreanza, Inferno Veneziano) and Maya Schneider (Inferno Veneziano).